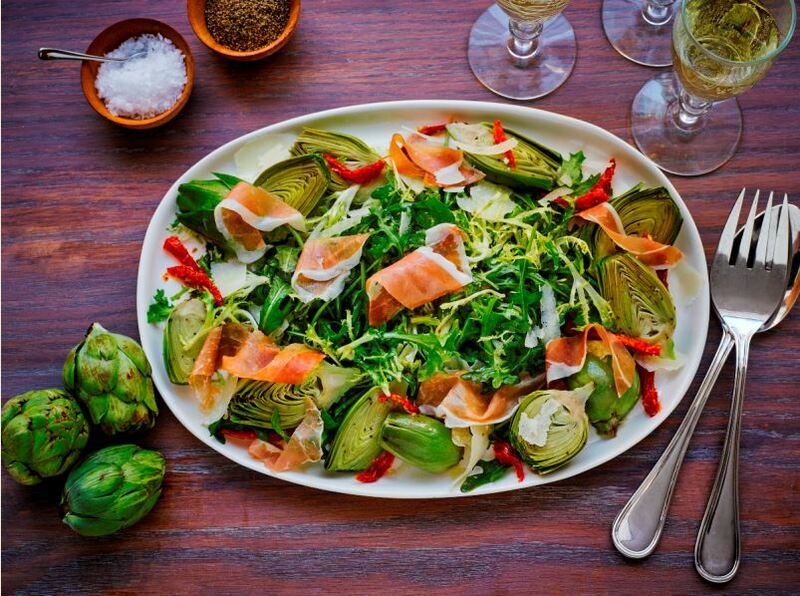 Simple to make, yet complexly seasoned, here’s a prosciutto salad with a lot of exciting flavors at play. With Prosciutto di Parma setting the canvas for the entire plate, there’s still so much more to savor. You’ll taste a tad of sweetness from leeks and honey, along with a nice acidity from balsamic vinegar and lemon. Sun-dried tomatoes and Grana Padano cheese serve as an added treat, infusing the artichoke and arugula with fantastic zest. Cheers to a prosciutto salad that nails a natural balance of sweet and tart. We love topping it off with a little extra vinaigrette! In a large pot of boiling water, cook artichokes until tender. Drain and let cool. In a medium bowl combine artichokes, lemon juice, 1 tablespoon of the olive oil, 1/8 teaspoon each salt and pepper; set aside. In a medium pan over medium low heat, melt butter. Add leek, stirring frequently, until golden brown; remove from heat. In a blender add leeks, vinegar, honey, mustard and remaining 1/8 teaspoon each salt and pepper. Puree the mixture, scraping down with a spatula occasionally. Add remaining 6 tablespoons olive oil to the blender. Puree until smooth. In a large bowl toss arugula, frisee, and 1 tablespoon of the vinaigrette. Place greens in the center of a serving plate. Add Prosciutto di Parma, sun dried tomatoes, shaved Grana Padano and artichokes around the greens. Drizzle with a tablespoon of the remaining vinaigrette.